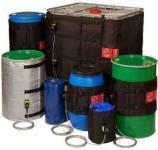 stock a large range of drum heating equipment and drum heaters for steel and plastic drums (25 Litre, 50 Litre, 100 Litre, 205 Litre). Our product range includes insulated drum heating jackets, base drum heaters, induction drum heaters and ATEX approved drum heaters. We can offer high power drum heaters and drum heating jackets which provide fast heat up times or lower powered drum heaters for gentle heat up of contents. Contact Us now for a quick quotation or click on request a quote and a member of our technical sales team will respond as soon as possible. 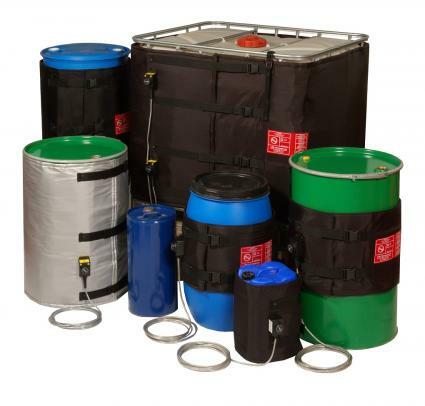 Our insulated drum heating jackets can be used for frost protection, temperature maintenance and heat up of drums containing sugars, oils, surfactants, fats (animal & vegetable), foodstuffs and chemicals. T&D also stock flexible heating jackets for 1000L IBCs and Totes. Please contact a T&D engineer who can help specify the correct flexible heating jacket for your application. Base drum heaters are manufactured silicone rubber insulated heater mats which provide an even distribution to the platen. If rapid heat up is required and the contents will accept heat rapidly, or solid medium are involved, a side drum heater can be used in conjunction with the base drum heater. Alternatively a thermally insulated drum heater jacket can be used. Silicone side drum heaters are a simple and effective method of applying heat to various size drums. Multiple silicone side drum heaters (up to a maximum of three) can be used to give quicker warm up times and higher product temperatures. Silicone side drum heater are specifically designed for the melting or reducing the viscosity of soaps, fats, varnishes and oil based type products. Side drum heaters can also be used in conjunction with base drum heaters to reduce product heat up time.